Designed for complete beginners, and tested for years with real learners, Complete Ancient Greek offers a bridge from the textbook to the real world, enabling you to learn the grammar, understand the vocabulary and even how to translate the writings of Socrates and Homer. Structured around authentic material, placing an emphasis on the importance of reading classical texts in the original, and introducing both a grammar perspective and a full introduction to essential vocabulary, this course also features: -25 learning units plus maps and verb guide -Authentic materials - language taught through key texts -Teaches the key skills - reading and understanding Ancient Greek grammar and vocabulary -Culture insights - learn about the culture and beliefs of the Ancient Greeks -Self tests and learning activities - see and track your own progress. 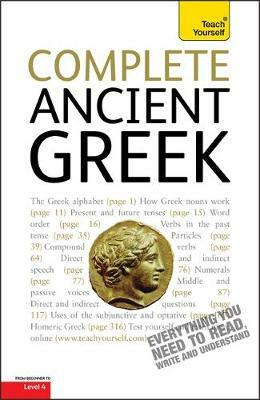 Featuring additional exercises in this new edition, this is a genuinely comprehensive yet accessible introduction to Ancient Greek. Rely on Teach Yourself, trusted by language learners for over 75 years.